If you had to identify yourself as a predominantly left- or right-brained thinker, which side would you lean most toward? Are you an analytical and task-oriented individual? Or do you have an affinity for creativity and tend to focus more on the bigger picture? People often segment themselves as strictly either left- or right-brained. But is it really that black and white, or is there more to our brains than dividing them into the left and right hemispheres? 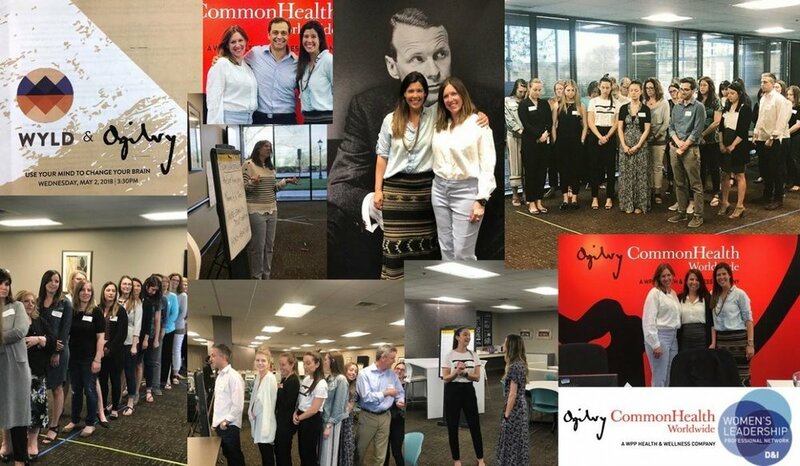 Recently a group of 30 Ogilvy CommonHealth Worldwide (OCHWW) employees attended the “Use Your Mind to Change Your Brain” workshop, where they were challenged to rethink how the brain works and explore the idea of an integrated brain. Presented by OCHWW’s Women’s Leadership Professional Network (WLPN), this workshop was the first of four in a speaker series that will be offered to WLPN members throughout 2018. Through the speaker series, the WLPN strives to achieve their goal of helping OCHWW employees step up and step forward, by providing access to inspiring leaders and helping to facilitate their professional success. In order to do so, the team wanted to kick off the series with more than just a lecture, and offer attendees the opportunity to participate in an interactive workshop that would leave WLPN members with a valuable new skill set and the motivation to put their learnings to use. As a leader, it’s important to be mindful of the energy you give off and the environment you are creating for others. Enter Kristin Meek and Kelly Lynch, leadership consultants from WYLD. Kristin and Kelly introduced the participants to the concept of the integrated brain, which links aspects from both the right and the left hemispheres. When done effectively and consistently, one can use the integrated brain to create mindful awareness, quickly recover from strong or negative emotions, and ultimately use the brain as a tool to become more successful as a leader in the workplace, and in one’s everyday life. According to Kristin and Kelly, the evolutionary purpose of emotions directly links to our survival instincts, as emotions were a gauge in prehistoric times to measure levels of danger or safety within the environment. Emotions heavily influenced decision making in this time period. Even today, strong negative emotions will evoke a “fight or flight” impulse in the brain, and can negatively affect productivity and effectiveness. According to Kristin and Kelly, you can either find yourself “above or below the line,” which refers to the distinction between positive (above) and negative (below) emotions. Instead of looking at the brain in halves, this thinking breaks the brain up into quadrants. Kristin and Kelly explained to the group that living “above the line” allows you to broaden and build: you’ll feel energized and will likely have increased productivity due to increased levels of oxytocin and serotonin hormones. On the contrary, living “below the line” causes you to constrict and shrink. In this state, your body releases hormones like cortisol and adrenaline. You’ll react more intensely to negative stimuli, and feelings like anger and sadness will continue to build upon themselves. During the workshop, Kristin and Kelly facilitated a musical tour of the brain, having everyone close their eyes while music was played to evoke feelings that mimic what it might feel like to be in each of the brain’s four quadrants. How you’re feeling within is usually visible to those around you. As a leader, it’s important to be mindful of the energy you give off and the environment you are creating for others. Effective leaders are able to create mindful awareness every day, and have an ability to recover from being “below the line” faster. This ultimately creates an environment of faith, hope, stability, and trust—the top qualities many look for in a leader. By remembering these takeaways, and by practicing to use your integrated brain, you’ll soon notice the impact you have on those around you and how they respond to you.